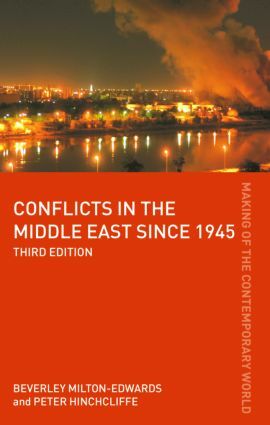 This third edition of Conflicts in the Middle East since 1945 analyzes the nature of conflict in the Middle East, with its racial, ethnic, political, cultural, religious and economic factors. Throughout the book Peter Hinchcliffe and Beverley Milton-Edwards put the main conflicts into their wider context, with thematic debates on issues such as the emergence of radical Islam, the resolution of conflicts, diplomacy and peace-making, and the role of the superpowers. The book is brought fully up to date with events in the Middle East, covering, for instance, developments in Iraq in 2006 where a democratically elected government is in place but the insurgency show no sign of coming under control. The analysis of the Palestinian/Israeli conflict is also brought up to the present day, to include the election of the Hamas government and the 2006 conflict between Israel and Lebanon’s Hizballah. Including a newly updated bibliography and maps of the area, this is the perfect introduction for all students wishing to understand the complex situation in the Middle East, in its historical context. Generation jihad: Conflict in the name of Islam?